What is Nylon (Polyamide) Fabric? How is it Used in Jackets? To some, we might have started out our series on fabrics that are used in jackets a bit upside down, as we firstly went through fabric technologies and compared several of the most popular ones to each other, and only recently turned to actual fabrics that make up jackets and the fabric technologies used in jackets. 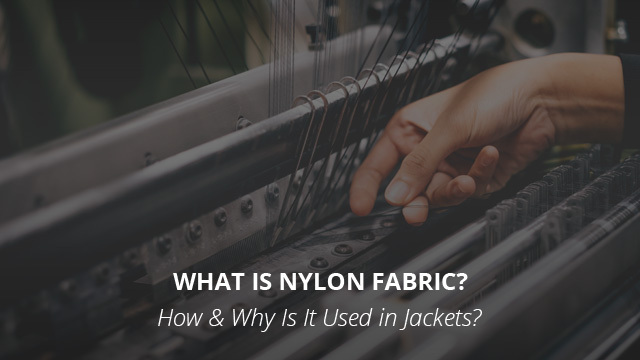 Not to worry, however, as we will cover all the bases, so that by the end of the fabric series those who are interested in learning more about the “hows” and “whys” of the different materials used in jackets, can find that information on our site. So far we have looked at Polyester and Elastane as two common materials that can be found in jackets, and it’s finally time to look at Nylon, which, together with Polyester, are the two staple fabrics used in jackets and many other outdoor clothing. Much like we did for Elastane and Polyester, in this article we will be learning more about Nylon, how it came to be and the reasons why and how it is used in jackets. 2. How is Nylon Made? 3. Characteristics of Nylon Fabric: Why Is It Used? 4. Why is Nylon Used in Jackets? 5. How is Nylon Used in Jackets? Both Nylon and Polyester were created by the same company, DuPont. Nylon was the first of the two, first introduced in the 1930s, when scientists at DuPont were looking to create a fiber that resembled silk. Nylon’s first major public debut was in nylon stockings, and then later in the 1940s the material was mainly used for military purposes, as part of tents and parachutes. Because the nylon garments that were originally created had issues with ‘runs’, stiffness, being non-absorbing and weren’t too comfortable, the blend with other fibers happened. Cotton and Polyester were the first and then, to reduce the stiffness of nylon and to make it more comfortable during movement, Elastane was combined with the fibers to improve it on those regards. Nowadays nylon fibers (but not only!) can be found on all different types of clothes and garments, from socks and underwear, to shirts, jackets, parkas and many other outdoor and indoor products made out of fabric. Being a man-made product, nylon goes through a chemical reaction between two large molecules, which are the dicarboxylic acid and the diamine, resulting in a polymer. While nylon is made into fibers by melting and spinning nylon chips by machines that pass the melted product through tiny holes placed on a wheel, those same chips also serve as raw material for plastic products. It’s this versatility that makes nylon so widely used in our daily lives. The nylon fabric itself is made by weaving nylon fibers together. These fibers can be in different lengths and sizes, depending on the spinning process they went through, and due to this it can result in fabrics of different weights and strengths, which is usually measured in deniers. While Nylon as a material is very versatile and finds use in many different industries, the fabric itself exhibits certain characteristics and qualities that make it so widely popular. First and foremost, nylon is considerably strong and durable as a fabric, making it more resistant to wear, meaning that it will last for a good amount of time. Due to it also being a bit flexible as a material, it further helps the fabric to return to its original shape without much loss to the look and feel of the garment. Being a very lightweight material means that the resulting fabric will also be so, making it desirable for use in many different clothes. Resistance to abrasion is important in fabrics that are made to be durable, especially those intended for outdoor wear, and nylon is quite abrasion-resistant. Also, nylon is considerably resistant to heat and temperature, having a melting point of around 500°F (260°C), which is a temperature that it won’t happen to come across during casual regular wear. In regards to weather-resistance, nylon is not very insulating, which works well for clothing that is more suited to milder and dry weather. It is also highly water-resistant, exhibiting very low adsorption. This comes in handy when you are looking to create garments that will not cause you to get soaked at the slightest contact with rain. It’s for this reason that you can find it in umbrellas, for example. Also, because of its moisture-resisting abilities and its synthetic composition, nylon is not prone to mold or mildew. Another very important quality is its oleophobic nature, meaning that it does not mind oil stains or body odor. Lastly, nylon is considerably resistant to common chemicals and substances that we use on our daily lives. However, in the presence of acids, phenols and other harsher chemicals it will dissolve. 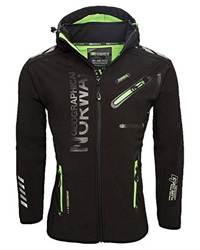 The characteristics above already give a good indication as to why Nylon is so widely used in jackets. Starting from the top, being mildly flexible, while at the same time very durable to wear and resistant to abrasions means that jackets made of nylon do not really mind contact with the outdoors. This allows for longer longevity of your jacket, as well as it makes it less prone to lose its appearance in its first season. Next, being good at resisting water is another necessary quality in jackets, as you often happen to get caught in unstable weather, where things might change in an instant. Being less insulating than Polyester, for example, it is more suitable to wear in warmer temperatures when you need proper coverage but not a stuffy jacket. Last, but definitely not least, its oleophobic nature makes it very easy to care for as it does not really tend to hold on to stains that are oil-based, and also, considering that our body odor is accompanied by our natural skin oils, unlike polyester which holds onto this odor, Nylon does not. All of that makes this fabric simple to clean and maintain. 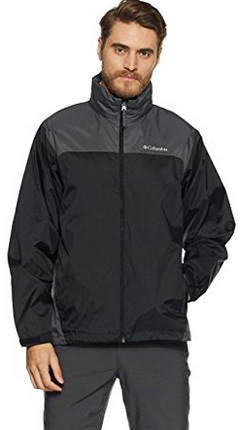 Typically, jackets that are made of nylon are windbreakers or rain jackets, which more often than not are also treated with DWR (water repellent) products, in order to help the fabric withstand moisture much better. 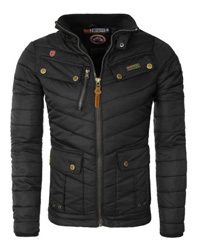 Jackets that rely on fabric insulation tend to not be made of nylon, as it is a bad insulator overall and, should it get wet, it stays so for a considerable amount of time, requiring more body heat to dry out. It’s for this reason that nylon is not really suited for jackets that are worn in low temperatures and high risk of rain. 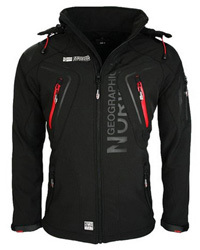 However, you will come across heavily-insulated jackets, such as down ones, made of nylon. 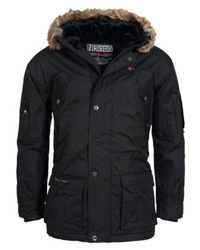 In those cases, the inner lining is usually polyester, which works well for insulating, and the jacket relies on retaining warmth on its filling, rather than the fabric. In the case of windbreakers and rain jackets, nylon works perfectly as it is a sturdy fabric that reacts very well to DWR treatments, being quite long-lasting in its water-resistant ability. As with all man-made products, nylon does cause environmental impact. This is cause for concern for some, and sometimes brands look into recycling in order to minimize this impact. In regards to its wear and overall behavior outdoors, while it is resistant to moisture, which in turn makes it quite resistant to mold and mildew, nylon tends to suffer under sunlight. This is most commonly observed in white nylon fabric, which gets a yellowish tint over time. The most major risk is that, should it catch fire, it will melt. For this reason it is also recommended to stay away from high temperatures and to avoid ironing the fabric. Besides, as a fabric, nylon is naturally resistant to wrinkles, thus making the issue of ironing entirely unnecessary. As you saw, Nylon is one of the best materials to have ever been created by man, with a very versatile nature that finds use not solely in the textile industry but all of the others who utilize plastic. As a fabric, it has qualities that make it quite useful for light garments, as well as jackets and outdoor gear, such as tents or umbrellas. It’s no wonder it is so commonly used by the outdoor clothing companies as a staple in their jacket making.